Last Tuesday evening, 10th October, Revd. Alastair Donaldson was instituted as Rector of the Kinawley& Holy Trinity Group of Parishes – Derrylin, Crom, Drumany (Chapel of Ease). Family, friends, parishioners as well as representatives of the local community and wider Diocese gathered for worship at Kinawley, Parish Church in Derrylin, to welcome Revd. Alastair as the new Incumbent. In the absence of Bishop Ferran Glenfield, who is recovering from surgery, Bishop’s Commissary, the Ven. Craig McCauley led proceeding assisted by Canon Hazel Hicks. The Very Revd. Arfon Williams, Dean of St. John’s Cathedral, Sligo, was in attendance as Registrar. Originally a native of Crossmaglen, Co. Armagh, Revd. 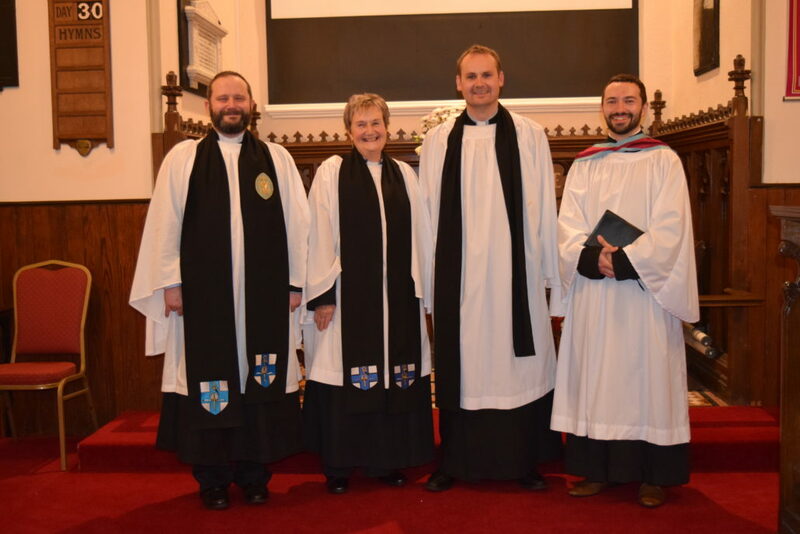 Alastair has been serving in the Kinawley Group since January 2018 as Curate to the Bishop. Before that he served as Curate in the Roscommon Group. The address at the institution was given by Mr Mathew Topley. Speaking from 2 Timothy 4:1-8, Matthew highlighted the charge given by Paul to Timothy to patiently, carefully and faithfully ‘preach the Word’ in all seasons. Matthew spoke about the challenge ministers of God’s Word face when people do not want to listen to God’s truth, but would rather find teachers who will tell them what they want to hear. Finally, Matthew encouraged Alastair and the congregation to follow Christ faithfully, reminding them that, though there will challenges, sharing the good news of Jesus Christ in word and deed will be worth it, because there will be a ‘crown of righteousness’ waiting on the last day to all faithful followers of Christ. The Act of Institution was then carried out by Archdeacon Craig, after which words of welcome were given by Mr John Rutledge on behalf of the Group of Parishes, Revd. Stephen Foster on behalf of Florencecourt Methodist Church, and Revd. Tanya Woods on behalf of the Diocese. During the service a token of appreciation was given to Revd. Tanya Woods for looking after the parishes during the vacancy. There was an acknowledgement made to the retired clergy and lay readers who led services and encouraged the congregationsduring the vacancy. Gifts of welcome were given to Revd. Alastair, his wife Elise and their little boy, Josiah. The service was followed by a sumptuous and welcome tea in the Church Hall. We pray for the Lord’s blessing on Revd. Alastair, Elise, Josiah and the people of the Kinawley and Holy Trinity Group as they continue to journey together with God and for God. The Ven. Craig McCauley, Canon Hazel Hicks, Revd. Alastair Donaldson and Mr. Matthew Topley.